I wish mine weren’t so far along. We are going to drop to 20 in a few days. They smell great though. Reminds me when I was a kid. We had a lot of wild plums growing on the side of a valley above a river. When standing on the top and the breeze was right the air was filled with the scent. What a great reward after a long ND winter. My E plums are still asleep as well as my Howard Miracle. They say that there is no E plum in it but you would think so by how late it is to open up. 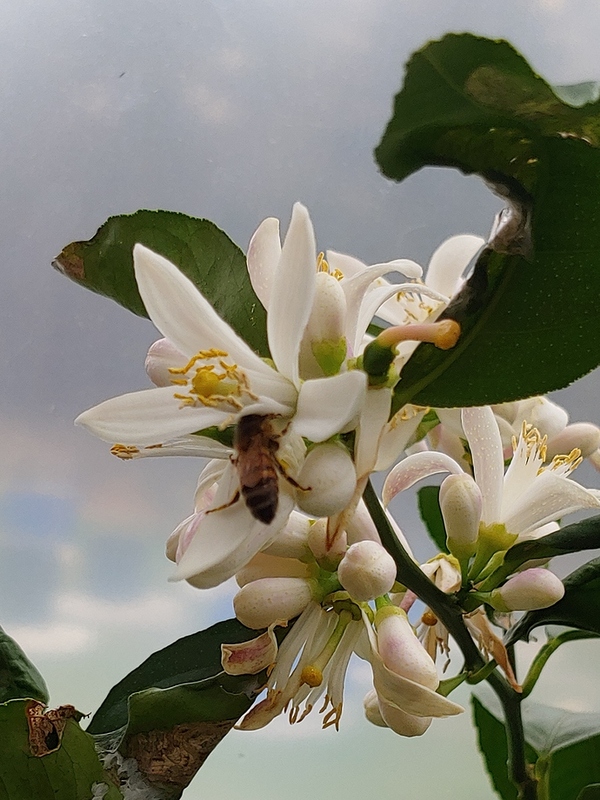 My first official orchard blooms were today-- warm again here. All-in-One almond and an unknown J plum that I can’t get pollinated. And a graft of Flavor Queen, so maybe that will do the trick finally! 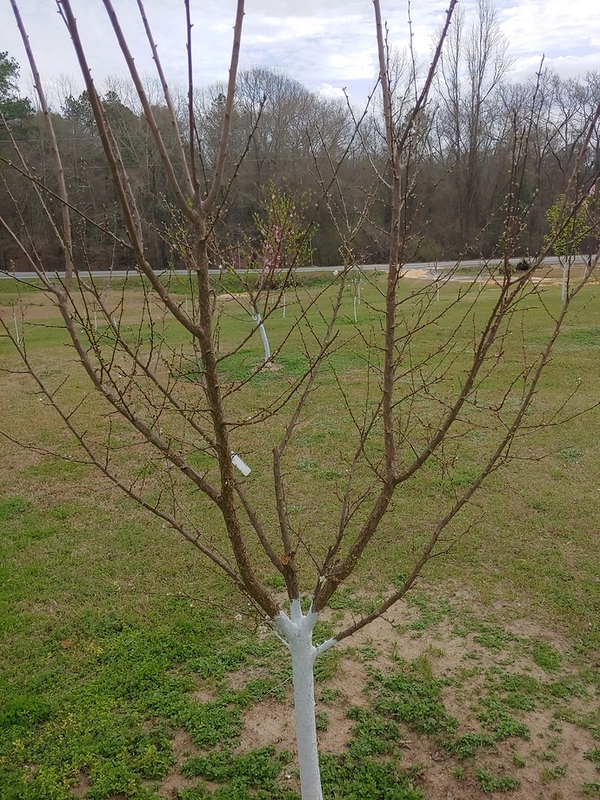 Other J plums, the peaches, and one apricot are swollen and getting there. I hope they hold off. @Graftman, where are you located in zone7 to be getting that kind of bloom this early. You can’t be to far north cuz we are still frozen in the snow banks up here. I just wanted to say that looks really neat. You must not have a problem with rabbits or deer where your at ah? What all is out there? I like the layout, looks like a great spot. I feel you, brother. Same here. Forecast for mid 20’s next week. 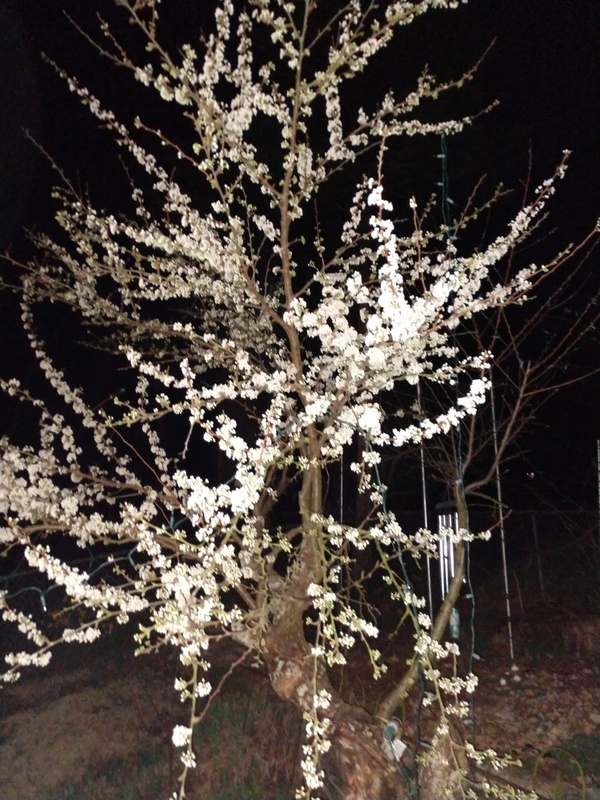 Greengage almost through blooming, Santa Rosa just beginning. Mostly open fields around so the deer aren’t around too much until the corn comes up. With our dog, they don’t seem to bother too much though. The deer around here don’t like lead Rabbits are another issue. We have tons of them, but try to thin them when we can. I can’t leave trees unprotected. Mostly, it’s pears (some Asian) and apples. It was an old corral, and had been a weedy mess, so I converted it to a better use. I dragged the area with a tractor and seeded it to grass to avoid the hill washing away, and then over a few years I filled it in with trees. 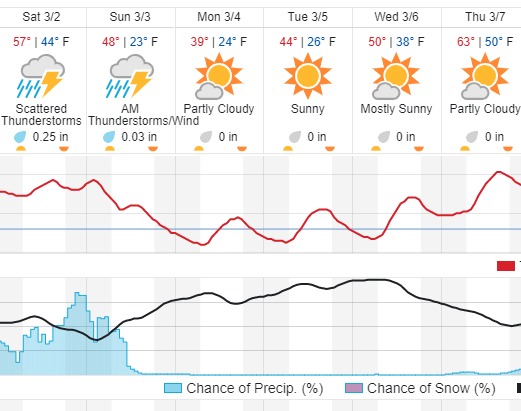 I thought with the slope, spring frosts might drain away down the hill…hopefully. Outside of the pic, we also have some persimmons and peaches. I would like to plant one more row of apples to the far end of the pic, but this winter there is a huge drift where the snow blew off the field, so I’ll have to think about that idea. Normally we don’t have this much snow. HA! I’d gladly trade you weather right now. Then the MN folks would want mine, it’s like a full circle share program. 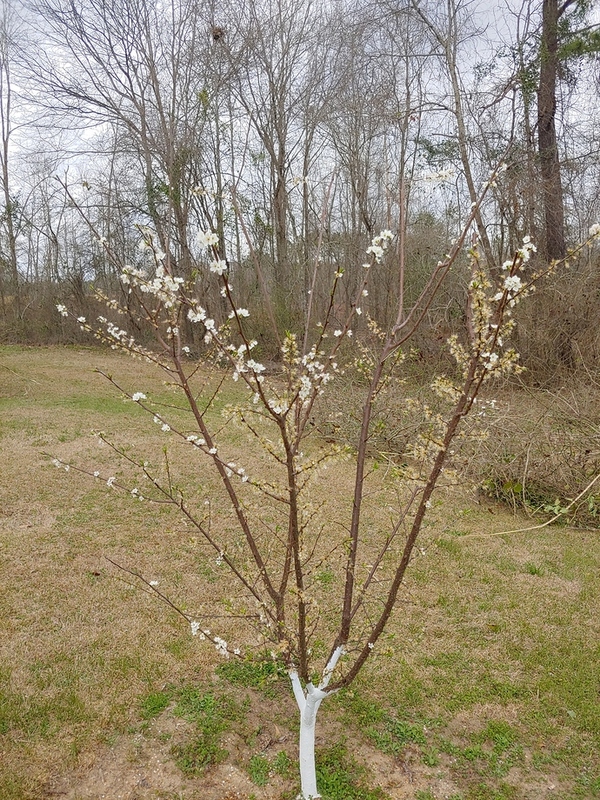 My Rio Oso Gem Peach tree. My apples are still pretty tightly closed, as is my cherry. We’ve had some sunshine and warmer temperatures here this week. 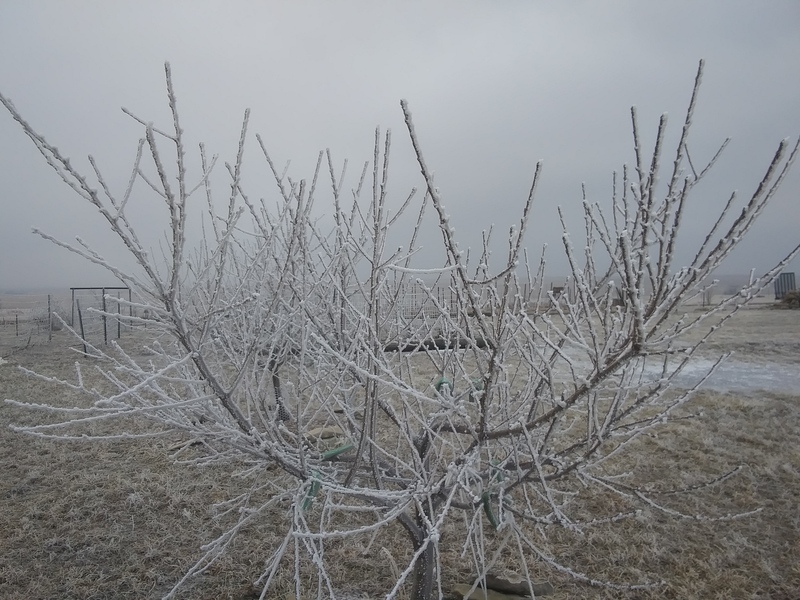 I’m guessing no plums this year and maybe a frost-bitten pear tree. 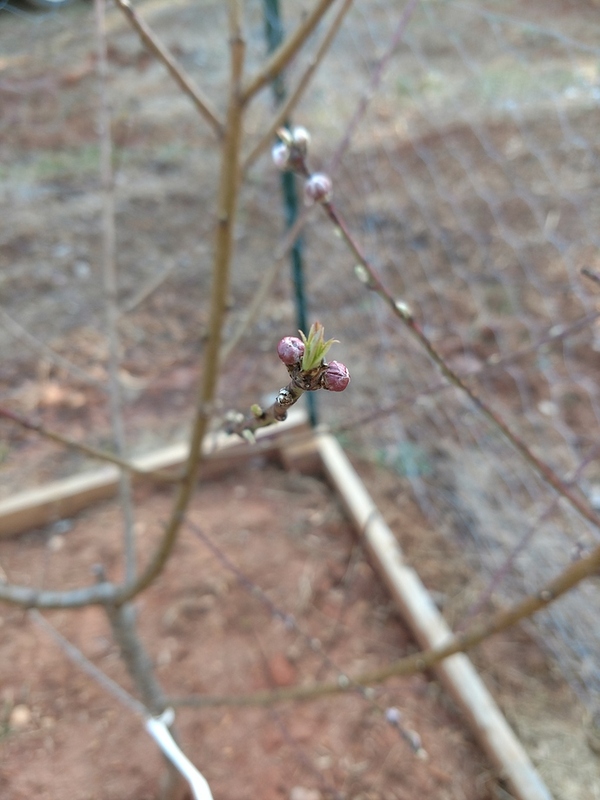 A few red leaves are poking out on some lower portions of my pomegranates, but not all. Cherries, jujubes, figs, and persimmon aren’t showing any buds breaking. I think Methley plum and Meadows pear might be just a weee bit too low on the chill hours for my area. 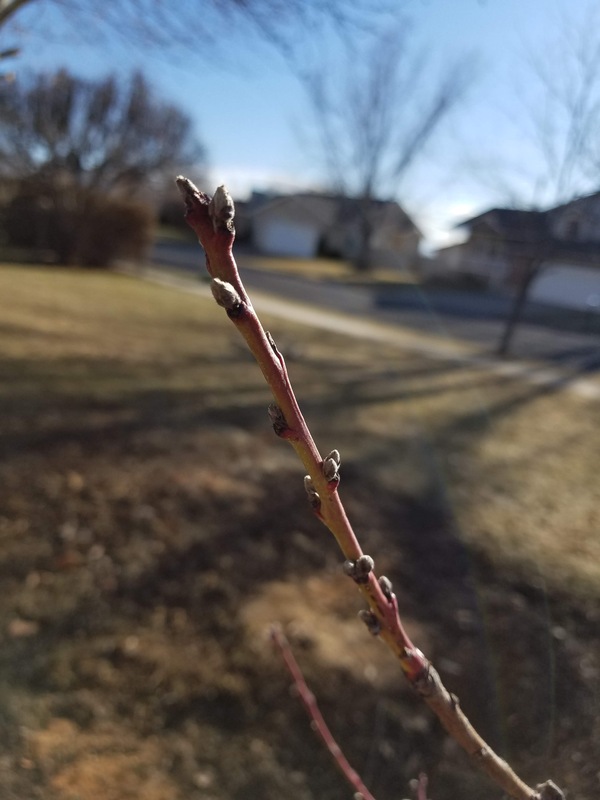 I have a Dixie Red Peach Tree that has green leaves and is getting ready to bloom. I planted it in Spring 2018. The bloom is way to early for my area, should be a minimum of two weeks out, preferably 4 to 5 weeks out. I took a closer look today, my Plums, Apples and Pear are still sound asleep. The Redhaven Peach buds are just starting to plump up, but the Moorpark Apricots are already showing a bit of color. 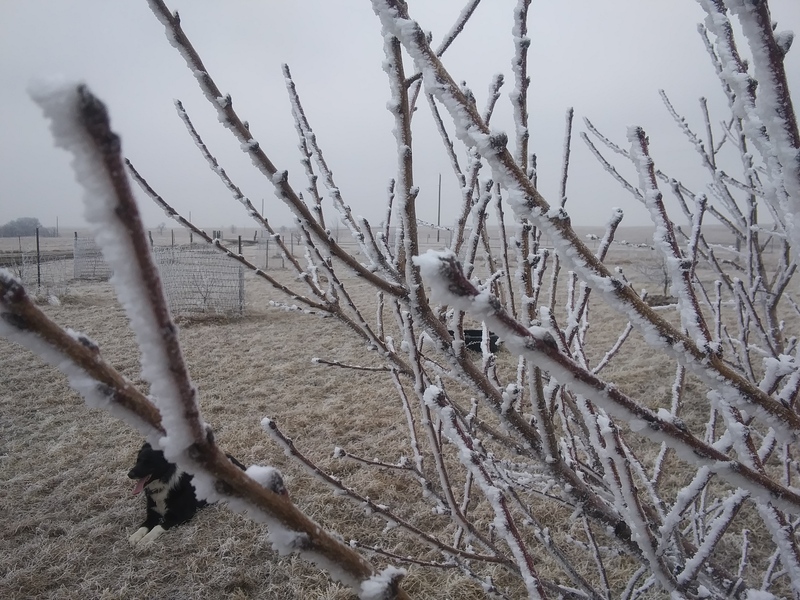 This was going to be my Apricot year, but probably not a chance now, with the next 2 days with a low of high 20’s, then 4 days with lows of 8, 9, 11, and 12, and daytime temps in low 20’s. With a few warm sunny days I did finally get a late dormant spray done that was overdue. My in ground Chicago Hardy Fig still scratches green at 4 feet after a Winter with weeks at low single digits, with the only protection a layer of wood chips at the base. I hope these few cold nights are the last of Winter here in 6B. 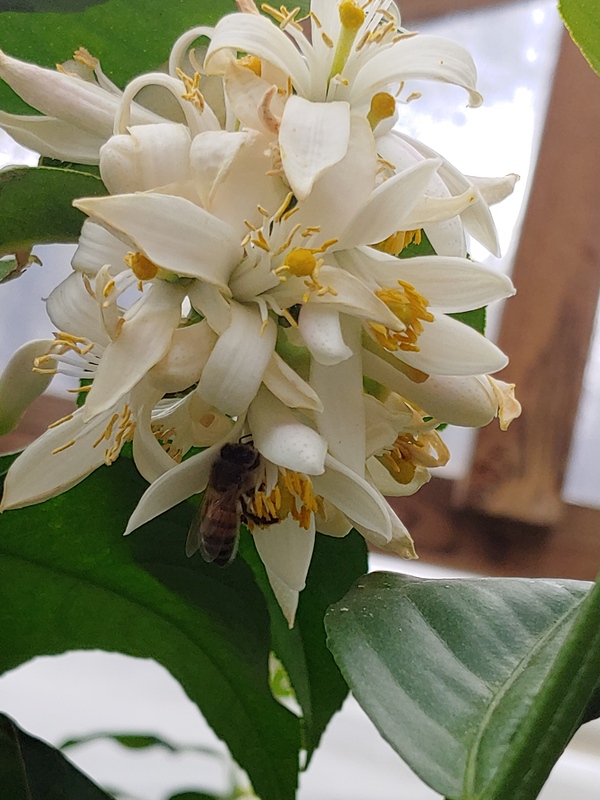 I’m sure enjoying the posts and pics of early blooms, are you folks with blooming trees seeing many bees out? I saw plenty of bees on crocus yesterday in a yard in Berea, Kentucky.